Want to take an epic trip to a remote corner of the globe while following in the footsteps of some of the greatest explorers and adventurers of all time? We have six suggestions for historical journeys that will allow you to do just that while sending you off on a grand adventure that is all your own. Norway's Roald Amundsen is one of the greatest polar explorers in history. Not only did he take part in the race to be the first to reach the North Pole, but he was in fact the first person to ever reach the South Pole too. Amundsen also led the first expedition to successfully cross The Northwest Passage, a treacherous waterway that runs through the Arctic above Canada, linking the Atlantic and Pacific Oceans. It took the Norwegian nearly two years to complete that crossing, but today it can be done in a matter of weeks. Shifting ice, warming waters, and changing climate conditions have made the Northwest Passage an option for travelers looking to see a part of the world that few ever get the chance to experience in person. Luxury travel company Abercrombie & Kent offer a 24-day trip through the Northwest Passage aboard a specially designed ship meant for travel in this part of the world. The voyage takes intrepid travelers from Quebec to Alaska, with visits to Greenland and the Bering Sea. The trip promises plenty of active excursions and interesting stops along the way, making this truly a trip of a lifetime. For hundreds of years, the ancient Silk Road ran from the Mediterranean Sea all the way to China, facilitating trade and the exchange of ideas across Asia, the Middle East, and parts of Europe. In 1271, a Venetian merchant by the name of Marco Polo, set off on a 24-year journey that spanned the length of the road, having many adventures along the way. Marco ended up spending many years in the court of Kublai Kahn himself, before eventually returning home with wondrous tales to share. Eventually, he penned a book entitled The Travels of Marco Polo, which introduced readers to far off places for the very first time and made Marco perhaps the most famous traveler in history. Modern travelers can still follow in Marco's footsteps either independently or as part of an organized tour. For instance, Intrepid Travel's The Great Silk Road itinerary is 32 days in length and takes adventurers from China to Uzbekistan, with plenty to see in between. The famous naturalist Charles Darwin first formulated his ideas on evolution and natural selection while visiting the Galapagos Islands. He was amongst the first Europeans to visit that place while taking part of a round-the-world sailing expedition aboard the HMS Beagle back in 1832. Those islands, which are found off the coast of Ecuador in South America, remain a living classroom, with a number of unique species of animals that are found nowhere else on Earth, including a unique iguana that the only one in the world that is known to go for a swim. 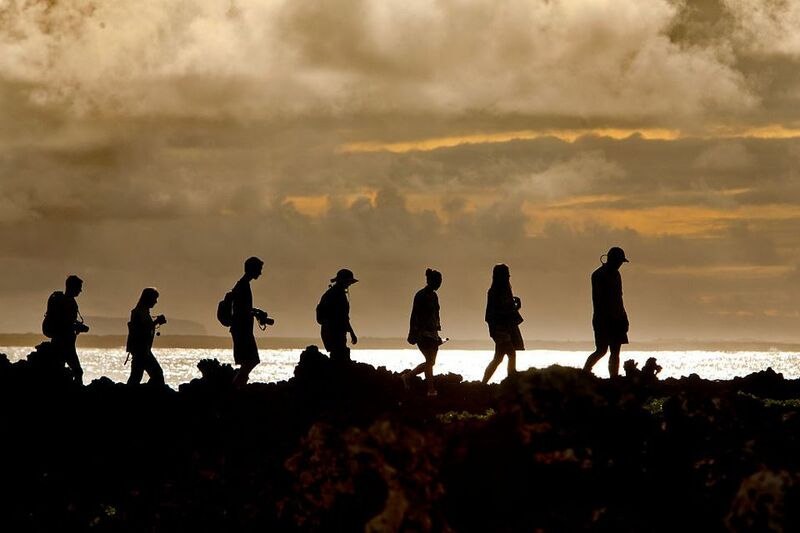 Of course, the Galapagos are one of the top bucket-list destinations for many adventure travelers, with thousands being lured there on an annual basis. There are literally dozens of different travel companies that can facilitate a visit to this amazing place, helping you to spot the same creature that Darwin discovered more than 185 years ago. For instance, G Adventures offers a number of options, ranging in length from 7 to 21 days, all at affordable prices too. Instrumental to exploring the African interior during the 1860's and 70's, Sir Samuel Baker, and his wife Lady Florence, mapped sections of the continent that had previously been unknown to Europeans. The Bakers were amongst the first to reach Lake Albert for example, as they searched for the elusive source of the mighty Nile River. Today, there is a 500 mile (805 km) long trekking route named for the explorer and his wife, which runs through South Sudan and Uganda, starting in Gondokoro and running to Baker's View, a point overlooking the lake itself. The sections in South Sudan remain dangerous to outsiders due to an ongoing civil war and political unrest there, but the Ugandan sections of the trail are open and safe to hike, welcoming adventurous independent trekkers looking for a truly unique adventure. In 1869, John Wesley Powell went on a three-month expedition down the length of the Colorado River, which at that time had yet to be explored. He and his team discovered dangerous rapids, hostile Native Americans, and landscapes that were incredibly breathtaking. Amongst them were the Grand Canyon, which remains an breathtaking draw for travelers to this day. If you want to see the Grand Canyon the same way that Powell and his men did, you'll need to raft its length and experience its turbulent waters first hand. OARS offers a variety of rafting trips through the national park, including an 18-day journey that takes you through the heart of this amazing place. Hannibal Barca wasn't a great explorer, but he was one of the greatest generals that has ever lived. Back in 220 BC, he helped start the Second Punic War with Rome, and for 15 years he occupied sections of the Italian Peninsula and generally went about making life miserable for the Roman Republic, which was still developing as a power in the Mediterranean. Fit and adventurous travelers can trace much of Hannibal's route, riding their bikes from Barcelona to the "Eternal City" as part of an itinerary offered by Ride & Seek. The entire trip last 29 days, crossing over the Pyrenees Mountains, into the Apennines, and down into Italy itself. The ride actually culminates in Rome, a city that Hannibal never actually got to see himself, but remains an amazing draw centuries later.